You are currently on: Anthropological Science page. Open sub navigation overlay. Anthropology is the study of humankind, and new developments mean many in the field need science expertise to be effective problem-solvers. New scientific methods and technologies in anthropological science include the analysis of DNA and ancient DNA, C-14 dating, stable isotope research, metallurgy, the analysis of live and fossil spores, the annual rings of trees, pollen grains, and human and animal remains, as well as the behavioural observation of humans and primates. This major will give you the chance to apply more science to your studies in archaeology and biological anthropology. Other sciences complement the study of Anthropological Science, for example, Biological Science, Environmental Science, Earth Sciences or Geography. Where can Anthropological Science take you? 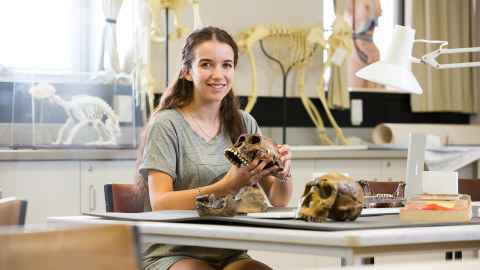 By integrating archaeology and biological anthropology with science disciplines, Anthropological Science equips graduates with the skills for employment or postgraduate research.